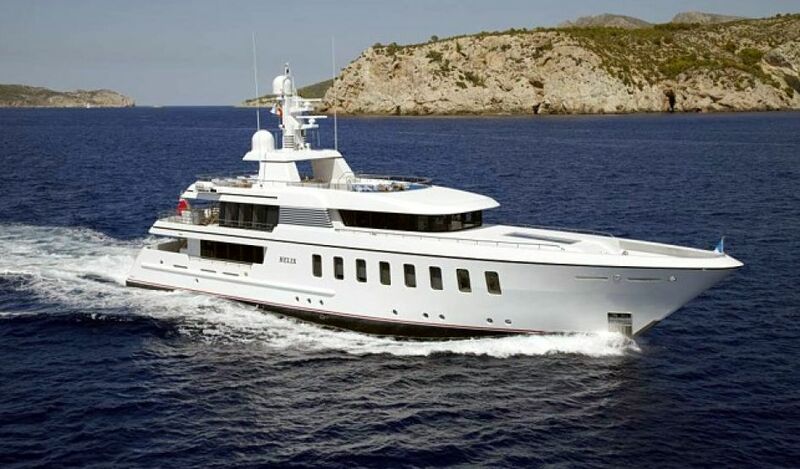 HELIX 45m Feadship super yacht charter. 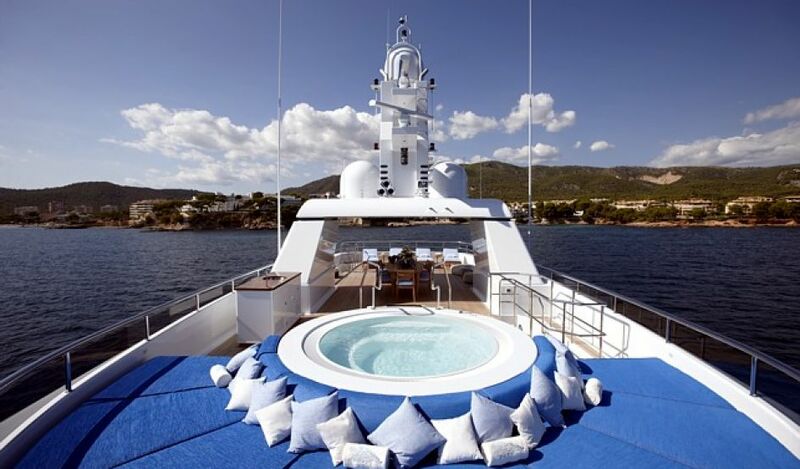 Available for private charter across the Mediterranean. Feadship Royal Van Lent shipyard launched the stunning F45, named Helix. 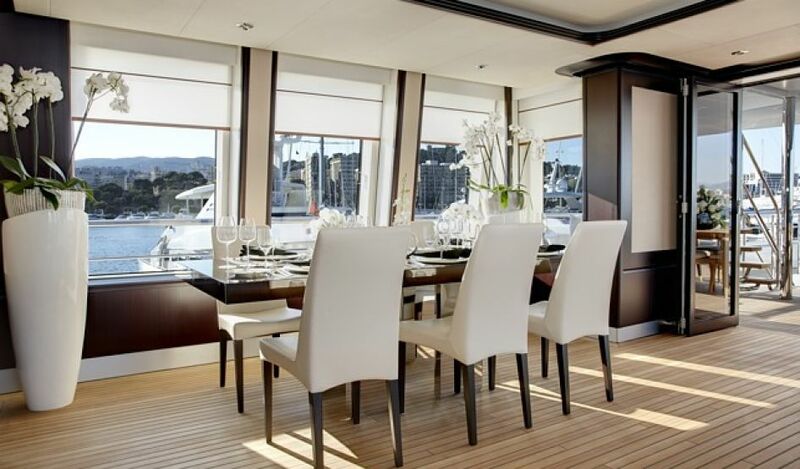 She is the first yacht in the series with the Nautical interior theme, which features a modern mix of light fabric covered walls in mahogany wooden frames and a high contrast in carefully selected materials. Designed by De Voogt Naval Architects and Sinot Yacht Design, Helix is an exceptionally sophisticated superyacht in terms of her layout, finish and technologies. 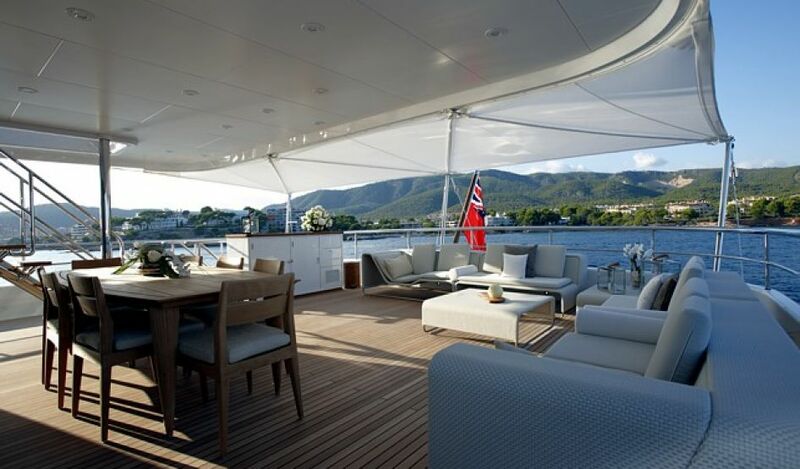 The F45 series offers a unique lay-out concept for a 45-metre yacht, where the guest cabins and the master cabin are all located on the main deck. This provides beautiful views from every cabin. Master Stateroom (double valted doors): Walk-around king bed, desk on starboard side, window seating on port side. Entertainment system with Large LCD high def flat screen TV/DVD. En-suite features large Jacuzzi tub, twin sinks, vanity, dressing area, separate shower, and private head. 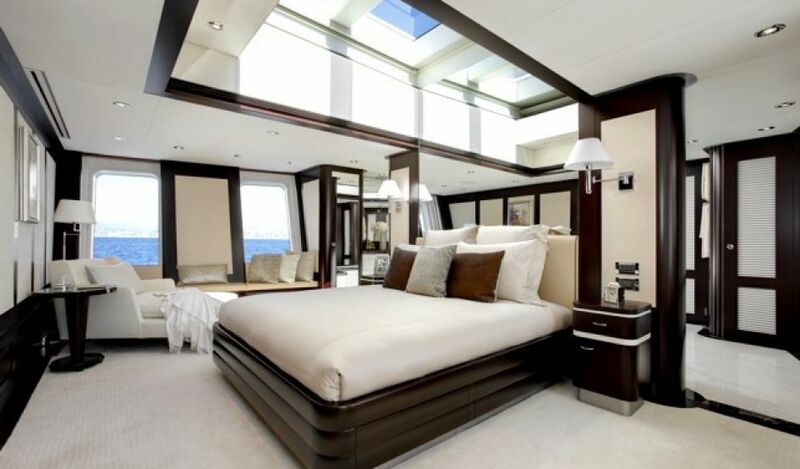 Inside the master suite, one discovers an overwhelming amount of space with plenty of natural light. High above the king sized bed is a skylight which brings in the natural light, yet it can be screened at the touch of a button. Behind the king sized bed is a partition screen and upholstered headboard between the bathroom and bedroom. This can be recessed to create a single open space. Guest Stateroom: Aft Port: walk around Queen bed (can convert to twins), desk/vanity. Entertainment system with large LCD high def flat screen TV/DVD system. En-suite bath with sink, and shower. There are 3 very large windows which allow stunning views and natural light. Guest Stateroom: Starboard: Aft Starboard: walk around Queen bed (can convert to twins), desk/vanity. Entertainment system with large LCD high def TV/DVD. En-suite bath with sink, and shower. There are 3 very large windows which allow stunning views and natural light. Safe. Guest Stateroom: Fwd Port: walk-around queen-size bed (can convert to twins), desk/vanity. Entertainment system with LCD high def flat screen TV/DVD. En-suite bath with sink, and shower. There are 3 very large windows which allow stunning views and natural light. Guest Stateroom: Fwd Starboard: walk-around queen-size bed (can convert to twins), desk/vanity. Entertainment system with LCD high def flat screen TV/DVD. En-suite bath with sink, and shower. There are 3 very large windows which allow stunning views and natural light. . Guest Stateroom/Private office: Bridge Deck: Double-sized Murphy bed. Entertainment system with LCD flatscreen TV/DVD. En-suite bath with sink, and shower. There are 3 very large windows which allow stunning views and natural light. This stateroom is better suited for kids. All staterooms have Large LCD high def flatscreen TVs. Also there are individual climate controls, complete blackout on windows and portholes, robes, hairdryers.